This help guide also covers features that are only available in the Pro Version of York. If you're interested in upgrading to pro, click here to learn more about the new features or go ahead and purchase York Pro for only $59. York Pro has many more customization options including typographic selectors, stylistic color pickers and other add-ons. And in addition to these fantastic features, you'll also receive dashboard one-click updates and access to world-class theme support by our team of in-house professional WordPress developers. Please note that support is only offered for York Pro. If you already have a Pro license and have any questions that are beyond the scope of this document, feel free to ask us via our dedicated help center. When uploading your theme with the installer, please ensure you are uploading the theme .zip file, not the entire package you downloaded. In this case, you will be uploading york.zip. To manually upload your new WordPress theme, login with your credentials to your website and locate the wp-content folder in your WordPress install files. Upload the un-zipped York folder into the: wp-content/themes folder. 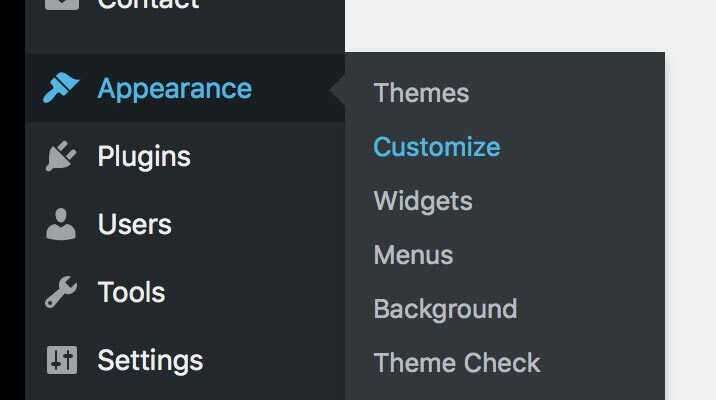 Once uploaded, activate the theme by heading to the “Themes” menu in the WordPress Dashboard. Locate the York theme and hit “Activate”. Located inside the /customizer folder within the package contents, you'll find a york-export.dat file. This file contains the live demo's Theme Customizer options. Import the york-export.dat file with the uploader within that section and hit "Import". Add a footer menu to your webite simply by creating a menu and assigning it to the Footer Menu location - as described above. The Social Menu is populated in both the site footer and sidebar elements of the theme. The social icons added to your menu will automatically populate in the site footer. To add the icons, simply create a custom link to the social media location and York Pro will do the rest. First, create a new page on your website, with the WP Dashboard > Pages > Add New link. 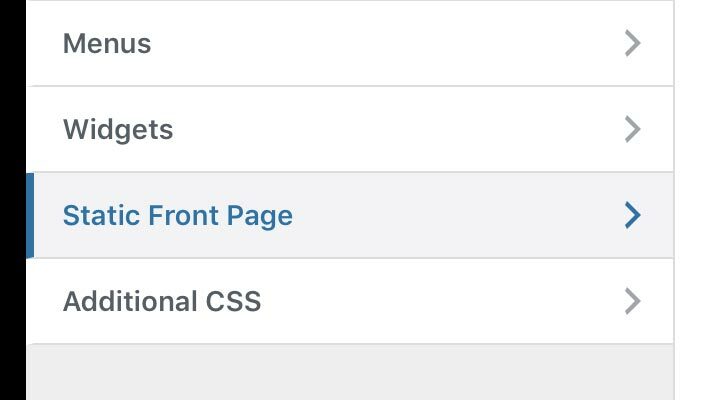 Next, you will need to set the page as your site's front page, via the WP Dashboard > Appearance > Customize page, within the Static Front Page panel. 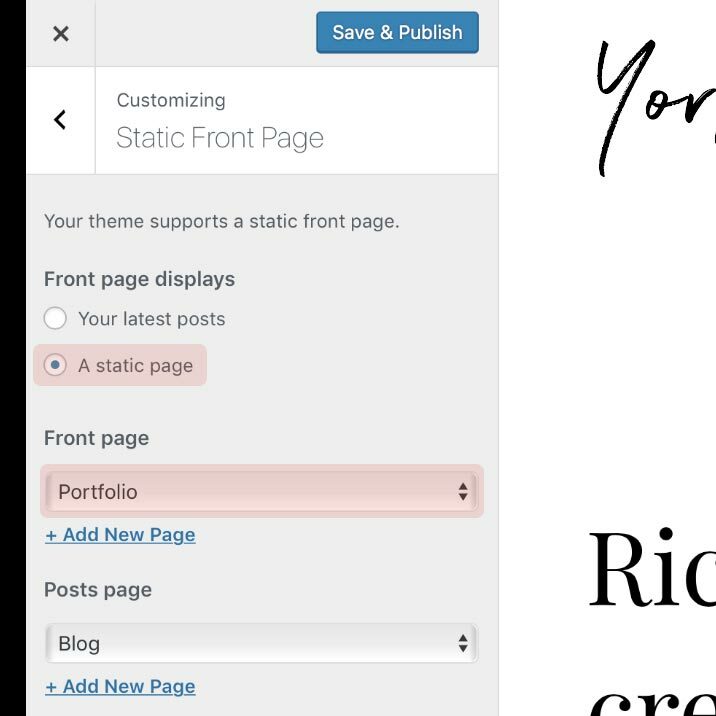 Next, to establish a static page, open the Static Front Page panel, within the Customizer. From the “Static Front Page” panel, select the static page option. This will set your website to display a page, instead of a blogroll, on the home page.Next select the templated page you first created as the Front Page option. Then hit the Save & Publish button up at the top of the Customizer window, and you should be all set. Below is an example of the animation code deployed on the York Pro demo. Simply add this to the Entry Header textarea within the "Page Settings" metabox (located beneath the page editor). Modify the text and add <b> elements as needed. To install the Bean Portoflio plugin, head over to our website and simply download the free Bean Portfolio WordPress plugin. Once you’ve successfully downloaded the zip file, head to your WordPress Dashboard and select Plugins > Add New > Upload. Add the zipped file in the field there and click Upload . Upon a successful upload, you’ll be prompted to activate the plugin. You’ll then see a new Portfolio tab in your WordPress Dashboard Sidebar. Creating portfolio posts is done exactly the same as standard posts. Upload a featured image - any size will work. The images will be automatically applied throughout all the neccessary templates and loops. Within the Portfolio Settings metabox, you may set the grid size for your portfolio project's featured image - that's used on the portfolio templates. There are four options: small, medium, large and xtra-large. You may add captions to your portfolio gallery image uploads within the Edit Gallery modal (the same modal where you orignially uploaded images to your portfolio post). Just add your caption to the "Caption this image" text box directly below each image, and your caption will appear on the portfolio post. York is capable of outputting gallery and video portfolio posts (embedded - e.g. Vimeo & YouTube). To change the type of portfolio to display, click on the checkboxes under the "Portfolio Format" metabox, located beneath the Portfolio Categories, on the right hand side of your window. Set your site title, tagline, logo and the site icon. You can also elect to retina-fy your logo. Turn off/on the sidebar flyout as well as the social navigational icons in the flyout. Also modify these colors: site title, site title hover, navigation icon, navigation icon hover and social icons. Decide if you'd like the gallery lazy loading active and the Photoswipe lightbox on. Enable the "Next" portfolio navigation feature. Lastly, enter the number of posts you'd like displayed originally on your portfolio template. Regarding colors, you may modify the overlay and overlay text colors. Turn on/off the "Powered by York Pro". Enable the Footer Call to Action and all relevant options. There's also all footer styling options to select the text color, link hover color, and social icons color. Within the Portfolio section of the Customizer, you'll find a select field to set an optional CSS3 Filter value (Black & White and Sepia). If activated, your portfolio items will default with the selected filter active. Easily modify the fonts throughout the theme - choosing from the entire Google fonts library. If you have not customized the original theme files then you may simply drop the updated theme folder contents into the theme folder on your server – which is located in wp-content/themes/york. Please note that licenses are only given for York Pro - not the free version.